Gotta love the pharaoh ant. These ants can be commonly found nesting in homes and buildings throughout Vancouver and Burnaby. They are either light yellow or a reddish brown in colour with a darker brown abdomen. Luckily, their tiny size of 1 to 2mm in length does not mean they bite people, nor are they venomous (phew!). They are, however, incredibly destructive ants once they get comfy where you don’t want them nesting. On top of that, their nests are quite small compared to that of carpenter or cornfield (moisture) ants, making it tough to find its exact location (it’s not too tough for us though!). The number one place that gets a lot more pharaoh ant infestation than anything is indoors, especially within hospitals. This is bad because not only is the foundation at risk, but patients too! That’s because pharaoh ants are major disease carriers, meaning hospital patients are at risk for catching salmonella, staphylococcus (Staph infection), and clostridium (which can potentially cause botulism). This is a triple whammy of ‘nope’ that you should beware of. It doesn’t help that the pharaoh ant’s diet is almost everything, but they especially love sweets and other insects. 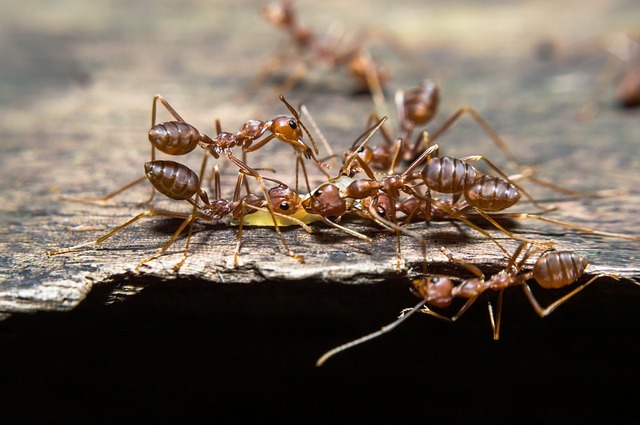 If you’ve got a pharaoh ant infestation, do not hesitate to call for pest control help since they’re a danger to both your home or building and your health. Get hold of your local Pest Boss if this sounds and looks like your current pest problem. We’ll get you, varmints!